This section features services of interest to Klinger Lake Residents. Why not add your business today? Many treatment plans available to fit your needs! "We Clear the Way for You to Play!" Guide and Kayak Rental available for many locations in St. Joseph County. If you've been thinking about a river adventure, we make it easy for you. By Appointment Only - Contact Jeff Pant at 269-625-0733. The next time a storm hits and you are looking for a good company to do tree trimming or removal, consider G&J Tree Service. They can also help improve your view of the lake by trimming trees that are obstructing the view. They also offer stump grinding service. Call Jim Reed at 266-467-8765 or email him at ​gjtreeserv@aol.com. Are you looking for a good place to have your hair styled? Look no further than Diane's Beauty Boutique Family Styling and Hair Care. Diane's salon is located just one block north of U.S.12 in White Pigeon, MI at 306 E. Michigan Avenue. Give Diane a call at 269-483-3155 to schedule your next appointment. You will not be disappointed! Lynne Kasey is one of Southwest Michigan's premier nature photographers.She resides on the southwest shore of Klinger Lake, where she has her own private nature park. Lynne also creates beautiful jewelry. For more information about Lynne and her work please visit her web site "My World" at www.lynnekasey.com. We are happy to welcome O'Donnell's Docks LLC as our advertiser here on the Klinger Lake Exchange. O'Donnell's Docks sells and services all major docks, boat lifts, and water front accessories. They have been serving Klinger Lake for over 20 years! Visit their page for more information. Let me update that plain concrete floor to one of beauty! New! Specially-formulated fuel for marine engines! No Ethanol! See Troy for details. A place for all your stuff! For all your tree maintenance needs! 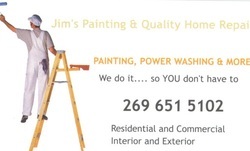 Painting, Power Washing, & More! Inside Out Inspections has been in business for 14 years. We are based in Chicagoland, but we can perform home and property inspections in the Sturgis area as well. We are licensed in the state of Illinois and members of the American Society of Home Inspectors - ASHI. Our toll free phone number is 888-519-7311. Visit our web site at www.insideoutinspections.com to learn more!